Writing comes naturally to us but limberness does not. Last time a cartwheel was attempted, a co-worker nearly had to drive us to the hospital. During our high school days, we were the only ones unable to touch our toes in gym class which was slightly embarrassing. Although we've never been flexible, at all, we've always had big dreams of being able to do a handstand. How amazing it must feel to have all the blood rush to the top of your brain for a couple seconds. We imagine it feels exhilarating and it sure does look cool but after numerous handstand attempts we've come to the conclusion that it's just not in our cards unless we wanted to end up with a concussion or broken wrist. We were just about to force ourselves to forget our longtime goal but our hopes were uplifted once the upside down costume was unveiled. The costume creates the optical illusion that we're standing on our hands even though—spoiler alert— we're not! We may not be able to do a handstand but with this costume, no one has to know that. 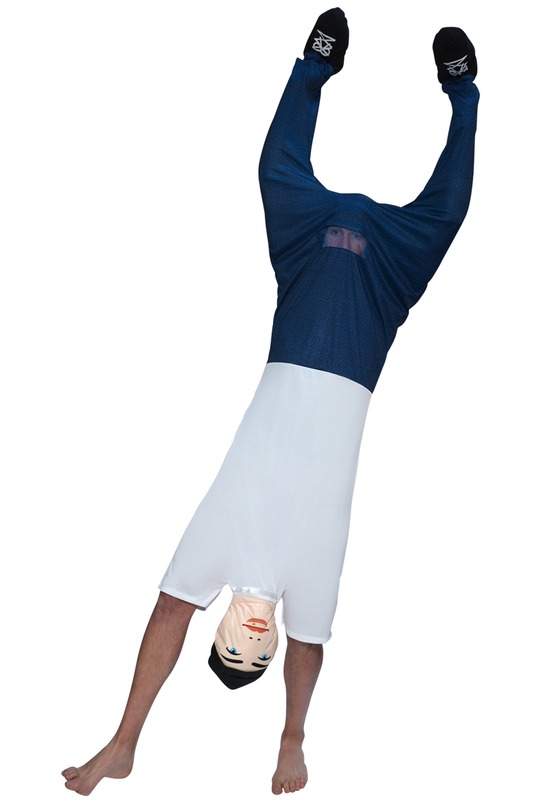 The adult upside down costume consists of a unisex romper to create the appearance your hands are actually your feet. (Whoa!) Stuffed shoes are at the end of legs that you can stuff w/ tissue or newsprint, while a stuffed head hangs between your legs to play a fun Halloween trick on anyone who catches a glimpse of you. A mesh inset at the top of the costume ensures you'll be able to see where you're going. the Halloween costume contest trophy, that is because you're destined to win if you wear the one-of-a-kind upside down costume. Pro tip: challenge a gullible buddy to a handstand contest and you'll definitely win that contest too!